King Cashalot jackpot slot machine – play for free! Play one of the biggest Progressive slots, King Cashalot, and you could become an instant millionaire. The game is available only in the best Microgaming Casinos, for example at Platinum Play online casino. Join the game now and claim 50 free spins and a $/€1000 free welcome bonus. This Progressive slot has 5×3 reels, 9 fixed Paylines, multiplying Wild and Scatter symbols and a bonus feature. With a Medieval theme, you will be exposed to bright colours, mythical creatures, beautiful damsels and a whole lot of winnings. You can bet up to 5 coins (0.05 coin value) on each of the 9 paylines, which will take the maximum wager (2.25 value) per spin to 45 coins! Max bets qualify for the Progressive jackpot which happens when 5 King Cashalot symbols line up on the 9th line. Don’t forget that the main prize is growing every single second! Pump it up and turn your life overnight! Apart from the stunning artwork and amazing theme King CashaLot progressive slot has some more nice features to offer. Unfortunately, there are no free spins available with the slot, but there are other options for players who are seeking extra bonus features. To trigger the rewarding bonus feature, you have to land the King’s pet Golden Dragon symbol. When the symbol is scattered on reels 2, 3 and 4, and this mythical feature opens the vault, the generous King Cashalot himself will offer you 3 chances to keep or pick from 8 bulging treasure chests. This impressive Microgaming Progressive slot has Wild multipliers and Scatter symbols coupled with a humorous theme that ensures you will be thoroughly entertained. In King Cashalot, the Jester is the Scatter symbol, with wins calculated on the total number of credits staked and are added to the payline wins. 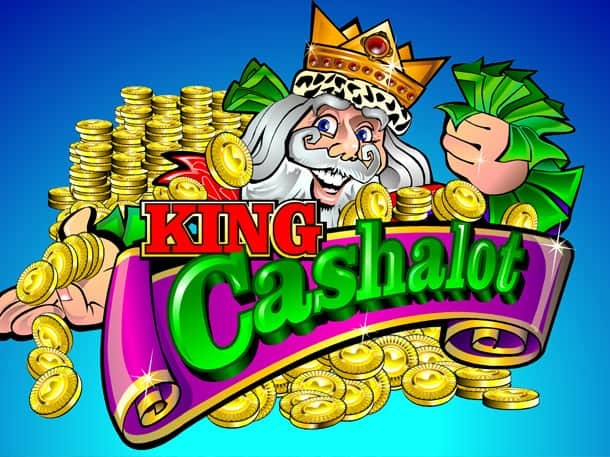 King Cashalot is the symbol to watch for, because as a Wild Multiplier, it will double your money when completing a valid winning combination. He substitutes for all symbols except Scatters and the Treasure Bonus symbol. The only coin size available is a 0.05 credit coin. The King symbol is a wild, multiplier symbol. Does not substitute for the Dragon symbol. Five King symbols displayed in a line on payline 9 wins the progressive jackpot. Only one winning combination is paid out per payline. If there is more than one possible winning combination ona payline, you are paid out the value of the highest combination only. The Jaster symbol is a scatter symbol. Three Dragon symbols scattered on the reels 2, 3and 4 activate the Treasure bonus game. You win random bonus win amounts. The wild, multiplier symbol does not substitute for the Dragon symbol to activate the Treasure Bonus Game. You choose objects to reveal random bonus win amounts. Eight treasure chests are displayed. Behind each treasure chest is a random bonus win amount. The win amounts displayed in the bonus game are already multiplied by your total bet amount. Only the bonus win amount is displayed. You can choose to Keep your win amount, or Pick Again and select another treasure chest. You can only Pick Again a maximum of three times. If you Pick Again, the bonus amount, the win amount is displayed in the win box and the game is over. Bonus wins are displayed in coins not credits. 5 King symbols displayed in a line on payline 9 wins the progressive jackpot. In order qualify for the progressive jackpot, you have to bet 45 coins per spin. The value of the progressive jackpot is displayed in credits (money value), not coins. Progressive jackpot games are only available to real money players. When the progressive jackpot is hit, all players worldwide are notified and the jackpot resets to a fixed minimum value. All jackpot winnings are subject to final confirmation by the casino and the Microgaming’s management. Their decision is final and no correspondence will be entered into. The casino has taken every possible measures to ensure that the progressive value displayed in the game matches the value on the casino server. The progressive jackpot value on the server is used when the progressive jackpot is paid out. All payout tables display the number of coins that are won for each combination. The total number of coins paid our depends on the number of coins you play per payline. The value pf the progressive jackpot is displayed in credits, not coins. The formula to calculate the conversion of your coins to credits is: number od coins x coin size played = amount in credits.